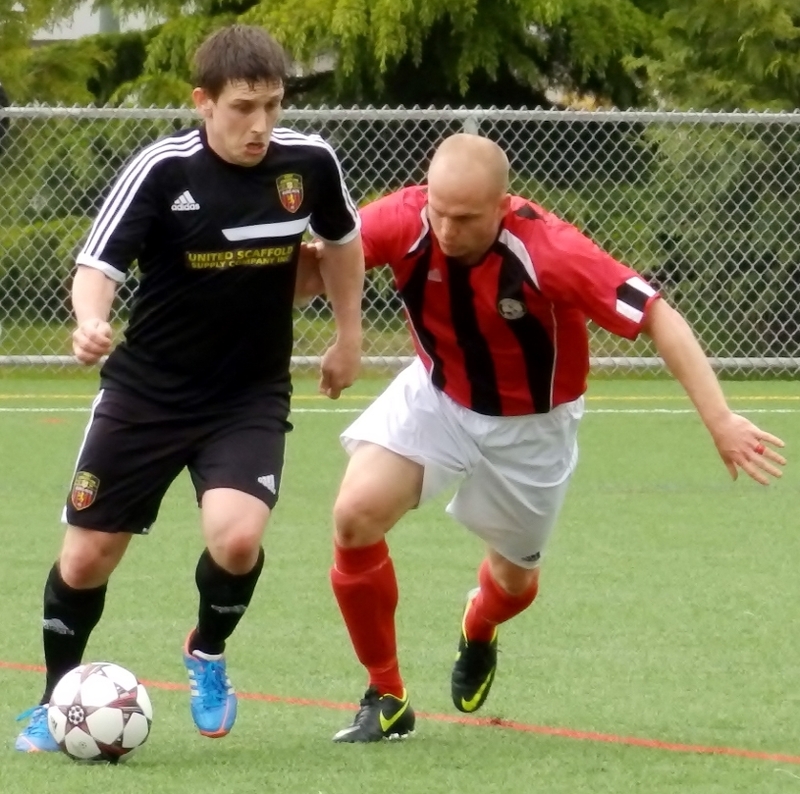 It was Finals Day in the 2014 BC Provincial Cup at Burnaby Lake on Saturday afternoon. All four of the Mens’ final took place, with three new Champions crowned, one back to back winners triumphing and three of the games being settled by a single goal. 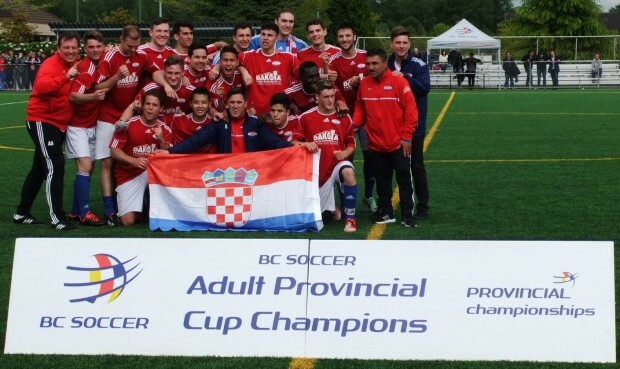 Vancouver Metro Soccer League (VMSL) sides dominated the finals, with Croatia SC lifting the ‘A’ Cup, PoCo Castilians the Masters and Guildford FC retaining their U21 title. South Burnaby Fighting Irish, of the BMSA, took home the ‘B’ Cup title, seeing off defending champs Richmond All Blacks. The showcase final of the afternoon saw Surrey United Firefighters going for their third straight ‘A’ Cup title against VMSL rivals Croatia SC. Both sides started lively and had a couple of half chances, with Taj Sangara coming closest for Croatia in the 18th minute when he broke quickly up the right wing and fired just past the left hand post. It was a similar break in the 24th minute that led to the opening goal. This time Nicolas Espinosa was on hand at the back post to put away what ended up being the Cup winning one for Croatia. Surrey were having the better of the possession and build up play, with Croatia happy to try and hit on the break and they had a couple of chances in the first 15 minutes of the second half to put the game away but couldn’t find a way past the Surrey keeper. The defending champions were pushing hard for the equaliser and won a series of corners, but their set piece delivery was particularly poor over the whole game and they never really threatened the Croatia defence or Simon Cohen in goal. Croatia nearly killed the game off with seven minutes remaining when they broke quickly from a Surrey corner and but the Firefighters keeper came up with a big stop to still give his team a chance. They couldn’t take it though and Colin Streckman’s low shot straight at Cohen in the last minute was all they could muster. The final whistle triggered jubilant scenes amongst the Croatia players and supporters, as Surrey just fell short of the historic threepeat. The win gave Croatia SC their first Provincial Cup since they won back to back titles in 1985 and 1986. They’ll now go on to represent BC at the Nationals in October. We unfortunately didn’t capture the winning goal on video as it took place during the ‘B’ Cup presentation, but you can watch some video below of the teams being piped on to the pitch, the final whistle, the trophy presentation and Croatia SC’s post game celebrations. The ‘B’ Cup final kicked off at 1.30pm and was a battle between the defending Champions, Richmond All Blacks, and South Burnaby Fighting Irish. Both sides were looking to cap off a successful season in style after having won their respective League titles. 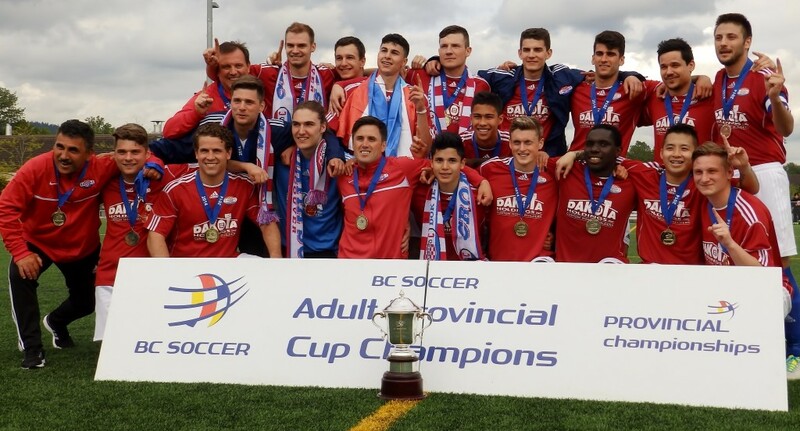 It was the Burnaby side that started the game the stronger and Daniel Williams had the best chance to open the scoring in the 12th minute when he was played in and with just the keeper to beat hit a weak shot off the left post. It wasn’t the most exciting game, with both teams being reduced to long range efforts and half chances, but Richmond should have gone in to the break in the lead after a gilt edged opportunity in first half stoppage time. Mason was played clean through, with time and just the keeper to beat, but Nour Fathy produced a great stop to send the teams in at the half 0-0. What the first half lacked in excitement was made up for at the start of the second. The Fighting Irish took the lead in the 51st minute when Brian Fox ran in to bullet home a header at the back post after some good work and a perfect cross from Connor Finucane out left. The All Blacks nearly hit back immediately but Ethan Lowenstein fired narrowly past the left hand post from a good position. The action was end to end and South Burnaby nearly doubled their advantage two minutes after taking the lead but this time Richard Sebulsky in the Richmond goal produced a point blank save to force another Fox header over. The BMSA champs came even closer just past the hour mark in a move that saw two shots crash off the bar, the second one from Fox, before Richmond finally cleared the danger. The Fighting Irish came close again two minutes later when the game’s Man of the Match, Evan Chapman, cut the ball inside to Williams in the box but the Burnaby player flashed his shot inches past the far post. After that neither side really had a clear cut chance. 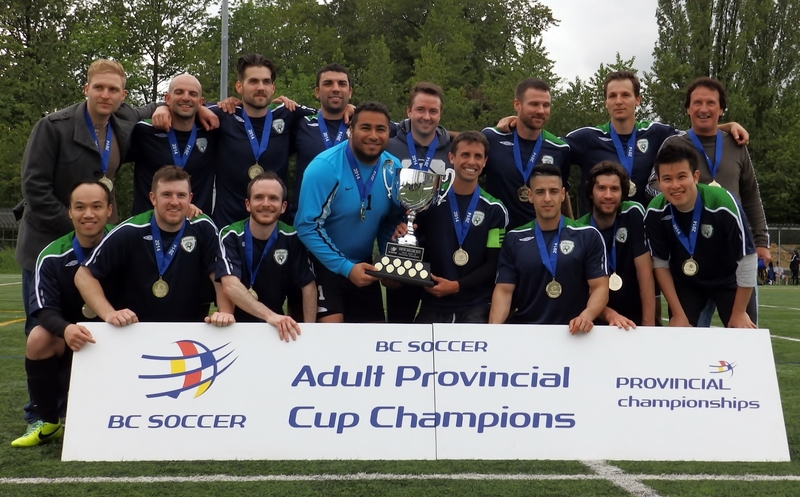 Richmond couldn’t find any way through the South Burnaby defence in the seven minutes of stoppage time and the Fighting Irish held firm with ease to lift their first Keith Millar Cup. You can see the goal, the trophy presentation and some other brief (and sometimes blurry!) highlights on the video below. The day’s action had kicked off at 10.30am, with an all-VMSL U21 final between defending Champions Guildford FC and EDC FC Burnaby. It was a closely contested affair for most of the match, with the majority of the drama coming in the last 15 minutes as Guildford bagged two goals on the way to retaining their title with a 3-0 victory. EDC finished the game with eight men, after three of their players were sent off in those closing minutes. They completely lost their composure and received their first sending off for a straight red, quickly followed by two others for second bookable offences. EDC then decided to leave the pitch at the end without collecting their medals. Bit of a bizarre end to what hadn’t been a particularly dirty match. 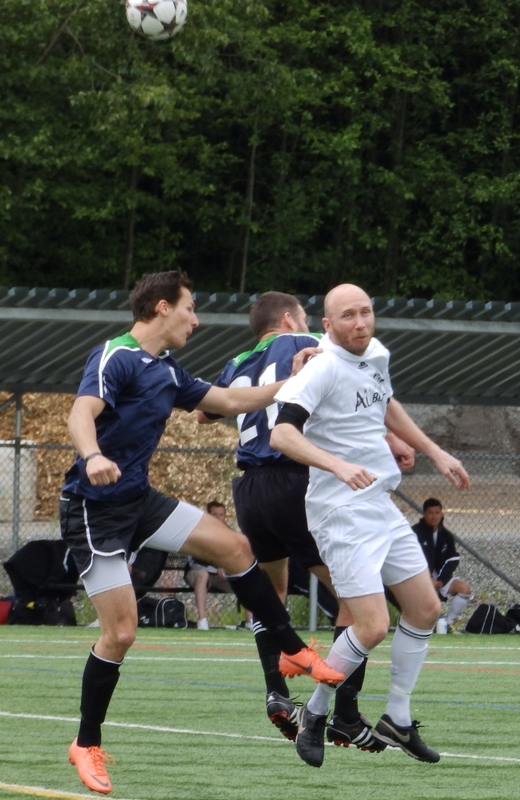 In the Masters final at noon, it took a single goal in the 69th minute to secure victory for another VMSL side. 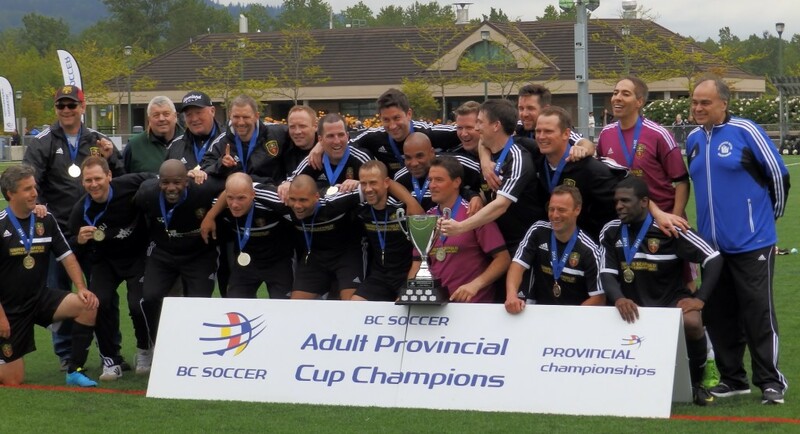 PoCo Castilians saw off the challenge of FVSL side North Delta SC Rangers to lift their first Deryl Hughes Cup. They will now represent BC in the CSA Club Westerns at the end of September. Congratulations to all of the winners and we bring you the jubilant A Cup, B Cup and Masters Champions below.